Bayer Leverkusen were victors in the game against Atletico Madrid at the BayArena on Wednesday night, winning the first leg 1-0, holding the away side to no away goals, which could be crucial to their chances of progressing to the quarter finals. Many expected a close encounter between the two sides and despite Leverkusen's poor form of late they started the game very brightly, after 12 minutes Emir Spahic had his effort cleared off the line by Mario Mandzukic and came even closer on 26 minutes when his long range strike cannoned off the crossbar. The German side began the second half brightly, Leverkusen took the lead in the 57th minute through Calhanoglu's fiercely struck shot beat Miguel Moya after a brilliant back heel by Karim Bellarabi. This prompted them to protect their lead and Atletico were applying all the pressure from this point, and controversially had a goal disallowed, the fourth official judging the ball had gone out of play from the corner and came back in before substitute Fernando Torres tapped in. The replays showed the official had made an error, and when Tiago picked up his second yellow card for a late challenge on Bellerabi, Madrid were almost certainly out of this game and will need to perform in the return leg. 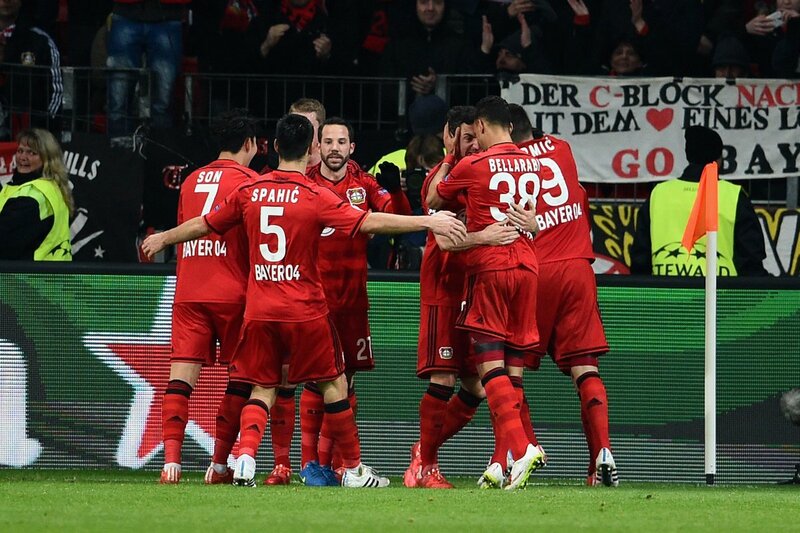 A sublime goal from Bayer Leverkusen gives them the edge over Atletico Madrid.